The science fairy tales make real dangers of concerns from the boundary between juvenile “why” questions and profound philosophical queries such as seeing in the dark, the inherent significance of shapes or the cause of dreams. It then addresses these troubles a as procedurals inspired by folk stories. In each, case, the answer is tied to “mushi”, a classification of organisms that are the distant ancestor of plants and animals, and who, in their own way, shape the physical and spiritual worlds. Think of them like the white mushroom people kodama of Princess Mononoke. The friction of the series occurs in the cases where the two life forms collide into each other. In their interactions with humanity, mushi may cause haunting, obsessions, or affliction such as deafness or deformation. Rather than malice or judgment, this is caused by the alien creature’s life cycle and mainly its move to persist. Besides their gift of vision, mushi experts or mushi-shi are needed because mushi are governed by rules, but not necessarily the rules that humans are familiar with from the natural world. This process of ferreting out the solution to mushi related occurrences and the meaning of phenomena involves a lot of Myst problem solving. As science, the mushi’s taxonomy and properties fail, but as metaphors that blend legends, human behavior, and creative pseudo-science, they are a beautiful invention. Each episode details the travelling mushi-shi Ginko’s encounter with a mushi phenomenon. The part shaman, part scientist trudges over Japan, carrying a peddler’s medicine chest on his back, and a cigarette whose smoke wards off unwanted mushi. The particulars of Ginko’s history does inform the stories, but to a limited degree, and the series is in no way his drama. it is the kind of anime that will keep you transfixed. It’s the late night anime trance effect. Especially considering that the series is composed of independent stories, its perfect pacing is a key asset. No episode struggles to fill 22 minutes or feels condensed. Mushi-shi might not be as pulse raising as a Berserk or even a Serial Experiments Lain, but its unconventional ideas and means of expressing itself ensure rapt attention. The tone is convincing enough that it’s not even an anime that requires a specific mood for watching. Much more detail at the full review. This sort of strikes me as a combination of Haibane Renmei and Kino no Tabi. I’ve just snagged the torrent, I think I’ll give this a shot. 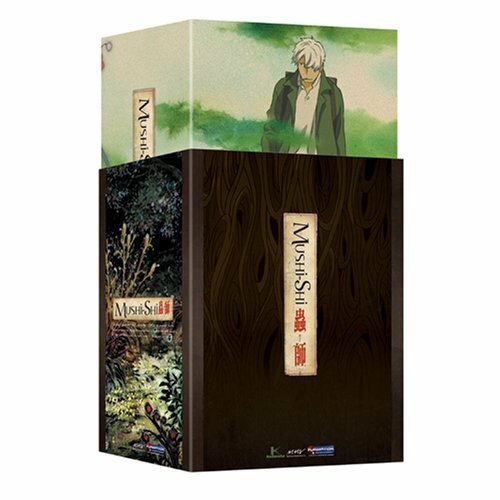 If I had to sum up Mushishi in one word, it would be “Zen”. An excellent series to watch. You’re in for a treat. Yeah, I just added it to my netflix queue – figured I should always give that a shot instead of download if its an option. Netflix has been pretty good in that regard. Maybe I should finally get around to Kamichu… argh!